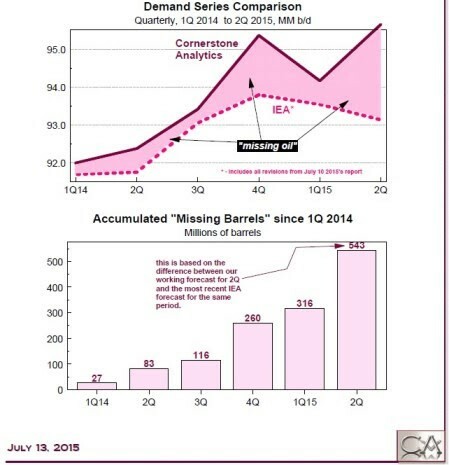 What is going on with IEA and EIA Oil Data? In the past, I documented the overstatements by both the IEA and EIA in 2014 & 2015 in terms of supply, inventory, and understatements of demand. Others also noticed these distortions and, whether intentional or not, they exist and they are very large in dollar terms. These distortions, which are affecting price through media hype and/or direct/indirect price manipulation, are quite possibly the largest in financial history. Putting numbers behind it, with worldwide production running some 95 million barrels per day, and assuming $55 per barrel for oil, the market for crude oil is about $5.2 billion per day. Each $10/Barrel change is worth nearly $1 billion/day or $365 Billion/year for the worldwide crude oil market. Add the worldwide equity market caps of oil and oil related equities and debt you have a scandal that is in the trillions, a number that cannot be ignored. I have maintained that oil should have corrected to around $70 in the fall of 2014, tied to U.S. production increases, which at the time represented the price at which drillers, would continue to add to supply. That price tied to cost reductions has probably been reduced to $60ish currently. But today, with the consensus oversupply widely quoted in the media as some 2 million barrels per day worldwide, it is clear that if the numbers were correct below, the perceived oversupply would not exist at all. Suffice it to say prices would be at least at the point where production would need to be added, perhaps around $60-$70 per barrel, if not higher. Furthermore, I do not even take into account whether oil futures are being manipulated (much like FX, GOLD, LIBOR – all have been either accused of or been caught in rigging scandals) along with every other commodity because of oil’s collapse and its financial impact. Why regulators, and especially the media, refuse to address this, even in theory, and instead choose to perpetuate the falsehood of oversupply is beyond me. In the last two months, E&P equities fell 10 weeks in a row, which has not happened since 1989. To answer our own question on why this entire event is being largely ignored, maybe that oil is thought to spur higher economic growth as suggested previously. However, so far that has yet to even materialize, as U.S. GDP growth has actually slowed, not accelerated. Only time will tell whether this exaggerated move in oil, as well as its volatility, is justified or not. As reported here, the EIA has already revised lower, though only slightly, its prior month’s production forecast as we predicted. Look for more of this to come.